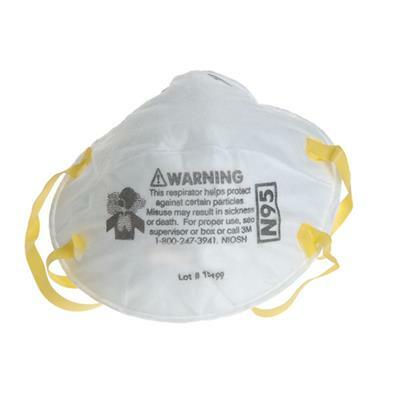 This disposable, NIOSH Approved Particulate N95 Respirator (#8210) was designed to provide exceptional comfort and protection from potentially dangerous particles in the air. Ideally suited for recommended use following a natural disaster or emergency, such as an earthquake, or a man-made disaster such as a fire or act of terrorism. Each respirator consists of a filter media, two straps and features a soft cushioned foam padded, curved, adjustable nose clip for added comfort and to provide a custom fit and secure seal to insure protection from contaminated particulates as they guarantee at least 95% filtration efficiency against solid and liquid aerosols that do not contain oil. Designed to help provide comfortable, reliable protection against certain non-oil based particles.Its lightweight construction helps promote greater acceptance and comfort and increased wear time. ALLERGY PROTECTION - This respirator is also a recommended effective and inexpensive solution for protectionfrom breathing in the airborne allergens that often lead to sneezing and respiratory distress. Case (160/Case):19" x 10" x 17"
Designed to help provide comfortable, reliable protection against certain non-oil based particles. Its lightweight construction helps promote greater acceptance and comfort and increased wear time. Non emergency applications include grinding, sanding, sweeping, bagging and other dusty operations. Recommended for allergy protection. This respirator features an adjustable noseclip to help provide a custom fit and secure seal. Hold the respirator in your hand with the metal adjusting strip away from you, allowing the headbands to hang below your hand. Press the respirator firmly against your face with the narrow end on the bridge of your nose. Pull the top strap over your head and position it high on the back of your head. Pull the bottom strap over your head and position it below your ears. Adjust the top and bottom strap lengths using both hands to pull the ends evenly towards the back of your head. Straps may be loosened by pushing the back of the buckle outward. Using both hands, mold the metal strip to the shape of your nose. Check the facepiece-to-face seal by cupping both hands over the respirator and inhale vigorously. A negative pressure should be detected inside the facepiece. If air leaks in from around your nose, reform the metal strip. If air leaks in from around the edges, reposition the straps. Repeat as necessary until no air leak is detected, and you have a satisfactory seal. N95 Mask as recommended by CDC for protection from a pandemic flu. After a disaster or terrorist attack, dangerous debris, bacteria, and fumes can be kicked up into the air we breathe. This particulate mask will protect you from at least 95% filtration efficiency against solid and liquid aerosols that do not contain oil.